Edgar Wright’s Baby Driver seeks to inject a dose of high octane into a heist film while illustrating how it’s possible to make a car chase exciting in an era when few action staples have become more boring and predictable. The film also stands as the summer of 2017’s anti-Michael Bay entry, using long takes and restrained editing to generate more energy than Bay achieved by flash-cutting his way through 150 minutes of incoherence in Transformers: The Last Knight. It’s a relief to find that some filmmakers working in the action/thriller arena still care about little things like narrative and character development and aren’t content to take the lazy way out and stun the viewer into submission by oversaturating with pyrotechnics and special effects. Baby Driver starts out with a bank robbery. 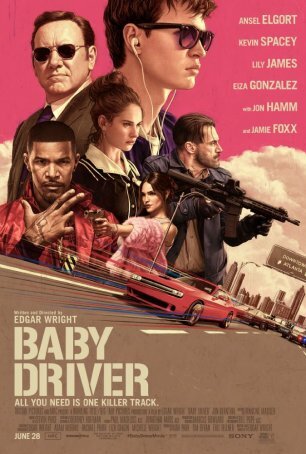 As Baby (Ansel Elgort), the supremely talented getaway driver, sits in the car listening to his iPod and revving the engine, the criminal trio of Buddy (Jon Hamm in true grit mode), Darling (Eiza Gonzalez), and Griff (Jon Bernthal) go about the business of liberating bags of cash. Once the cops have been eluded, the four culprits meet up with the mastermind, Doc (Kevin Spacey, radiating menace and class as only he can), to divvy up the loot. We soon learn that Baby, not a prototypical criminal, is working off a debt. One more job and it will be paid. That caper turns out to be a nasty one with three new brutes – Eddie (Flea), J.D. (Lanny Joon), and sociopath Bats (Jamie Foxx, finding the dark side) – holding up an armored car. Baby is so unnerved by the resulting carnage that his driving is sloppy and the robbery nearly ends in disaster. Meanwhile, in his personal life, he is developing a playful rapport with a waitress, Debora (Lily James), at his favorite restaurant – an attachment Doc uses when he decides that he doesn’t want to go looking for a new driver for his next score: the takedown of a U.S. post office. Discussion of most action/thrillers begins with the director’s ability to generate suspense. That, after all, is the primary characteristic viewers are expecting. Wright gets the job done but not by assembling the film in the editing room using cuts that are approximately a half-second in length. Nor does he feel compelled to do everything using CGI. It’s possible that computers were employed to some degree in the chase sequences – I don’t know one way or the other – but most of the stunts are done using real cars careening down real Atlanta streets. And, although Wright choreographs the car action carefully, he does so with a cursory nod to the reality of physics. These qualities give Baby Driver an edge that the recent Fast and Furious movies have lacked. We feel like we’re inside a car rather than watching one in a video game. The soundtrack is wide, varied, and selected to match the action (sometimes ironically). Want an eclectic mix tape? How about “Bellbottoms” by The Jon Spence Blues Explosion, “Let’s Go Away for a While” by the Beach Boys, “Unsquare Dance” by Dave Brubeck, “Easy” by The Commodores, “Debora” By T. Rex, “Tequila” by The Button Down Brass, “Every Little Bit Hurts” by Brenda Holloway, “Never, Never Gonna Give Ya Up” by Barry White, and “Brighton Rock” by Queen. These aren’t just songs thrown together to sell a soundtrack; they’re organic to the movie’s DNA. They take what Guardians of the Galaxy did with pop music to the next level. Wright is savvy enough to realize that suspense and tension require characters that are more than human figures in a CGI playground. He does just enough with the men and women populating Baby Driver for us to get a sense of who they are. Baby, for example, has a tragic past that gradually comes to light through flashbacks. Doc is more than just the cold, conniving gangster we first meet. Various other characters have slight shadings that make them more interesting than the types upon which they are built. The romance between Baby and Debora makes use of the strong chemistry between Ansel Elgort (The Fault in Our Stars) and Lily James (the “Downton Abbey” actress whose star is on the rise), getting us to care about them and, as a result, elevating the stakes. Sometimes, timing is everything for a movie, and Baby Driver is being released into a parched and barren cinematic landscape where the best things currently showing are a month old. The movie, which is smaller in scale than a lot of the other films currently playing, outshines many of them with its freshness and energy. It’s neither bloated nor overwrought and its combination of good pacing and a willingness to tell a story remind us of what summer movies once were. Take Baby Driver for a spin around the block – you’re unlikely to regret it.